I didn’t expect this one, but I like it. So this one caught me off guard. I used to watch 24 back in the day. And if you watch a random movie from the ’80s and the ’90s you’ll probably see this guy as one of the bad guys. The cool thing about him is that when he’s on screen you’re drawn to what he’s doing even if he’s not the main character. He’s good at acting and I think he’s pretty good at this country thing too. 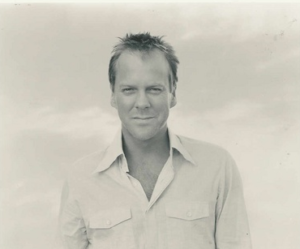 Here is the new country single from Kiefer Sutherland. I didn’t really go into this song with expectations. You never know what to expect when someone from another art comes into the singing world and especially the country world. But I admire those that try because they’re really putting themselves out there and for some reason our world likes to bring people down when they try new things. It’s definitely rooted in the traditional country world. The lyrics are ones we’ve heard in similar songs in the past, but with Kiefer’s voice it sounds new and different. I would say that it sounds good. He definitely has a good traditional country voice. The melody is solid. That’s really what I like about this song the most. It’s kind of catchy and by the end I had myself kind of nodding along and singing along to the chorus. I don’t know if this will be a big hit at country radio, but you never know. Kiefer definitely has a following and this one could get some attention. I love it! Listened a few times and can’t get it out of my head. It soulful and his gravelly world worn voice sells it beautifully. Would make a great last dance song.